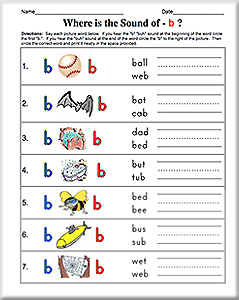 Students learn phonics and phonemic awareness skills at lightning speed using these high quality phonics worksheets and activities. 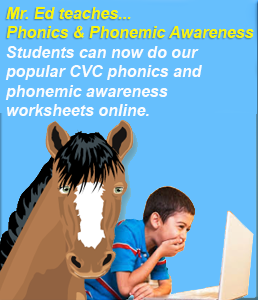 Primary emphasis is on teaching consonant sounds, short vowel sounds, long vowel sounds, digraphs (ai, ee, oa, etc), r-controlled vowels (ar, er, ir, ur, or) and 100 common nouns associated with these sounds. Click any image below to view activities. 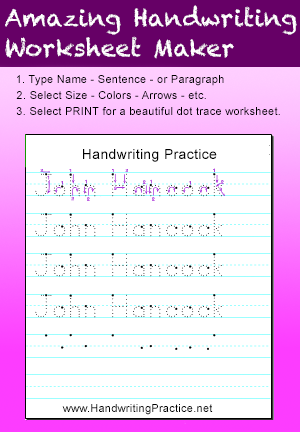 Type student name, small sentence or paragraph and watch a beautiful dot trace or hollow letter handwriting worksheet appear before your eyes. You can then change letter size, letter or line color, add arrows, starting dots or make a blank line. You can also make custom alphlabet letter practice or phonics worksheets by typing any letter combination you would like. Where is the Consonant Sound? 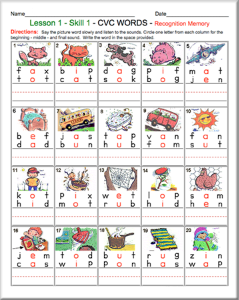 Note how we organize the letter columns below each CVC word in these power phonics worksheets. Students circle the letter for the beginning sound - then the letter for middle sound - and then circle the letter for the final sound. With only two letter choices for each sound, correct answers improve dramatically. This results in a greatly improved attitude toward learning - decreased frustration and heightened self-esteem. Five skill levels are used to guide students through learning the sounds and 20 words in each Lesson. Skill 2 becomes a little more difficult as students must now enter the first letter sound without viewing choices (but choices still remain for the 2nd and 3rd sounds). After passing the final Skill 5 worksheet for these 20 CVC words in Lesson 1, we move to Lesson 2. Lesson 2 then teaches the 20 common long vowel words that follow the "Final-e rule" (bike, cake, kite, etc). Lessons 3, 4 and 5 teach common words with digraphs (ai - ee - ie - oa) - r-controlled vowels (ar-er-ir-ur-or) and other advanced sounds. These worksheets can soon be done on the computer. This new version (called Mr. Ed Phonics Tutor), has a built in teacher that "jumps-in" to teach at the moment any wrong answer is selected. In other words, every one of your students will now have a high quality tutor sitting next to them while doing this activity. Our Mr. Ed Phonics project is currently converting our popular phonics worksheets to electronic form so they can be done online. Called Mr. Ed, (Ed is for Education), this new electronic version is identical to the paper activities seen at left - except students can now use the computer to click the correct beginning, middle and final sounds in each word. If an answer is not correct, Mr. Ed immediately "jumps-in" and teaches the correct answer. This is known as immediate feedback and results in a greatly accelerated learning process. Because our cartoon characters correct and teach every mistake, this makes for a powerful tutoring actiivity that will keep students inolved for 20-30 minutes without needing any teacher assistance. Did we mention? Mr. Ed and friends like to have fun when teaching as well.